This February 26, all eyes will be on Hollywood when the stars come out for the 84th Academy Awards. Millions of people worldwide will watch as Oscar once again takes center stage … just a couple of hours north of us. I grew up on the fringes of Hollywood. My mom and her brother worked in vaudeville in the Hollywood of the 1920s and early 1930s, billed as the “world’s tiniest acrobats.” Later, my dad, an Iowa transplant who settled in Hollywood after returning from service in World War II, was a police officer with the LAPD, working in the West Hollywood, Hollywood and Van Nuys divisions, where he retired as a homicide detective. As a kid, I loved to take in a movie at Grauman’s Chinese Theatre, but the surrounding area grew tackier and seedier with each succeeding decade. But, in the 1990s, the powers that be in Hollywood had an “Aha!” moment. They realized that they needed to bring the glamour back to tinseltown. Today you can once again have a grand time in Hollywood. Last month that’s just what I did, cramming a lot of star-studded excitement and nostalgia into just three days. You can, too. Here’s how! You may not be too familiar with the Sunset Marquis, and that’s just how the celebrities, particularly those connected with the music industry, like it. This West Hollywood hotel, which opened in 1963, is discreetly tucked away at 1200 Alta Loma Road, just a block off, but worlds away, from Sunset Boulevard. (By the way, for all intents and purposes, West Hollywood is part of Hollywood). The Sunset Marquis’ industry celebs have included U2, the Rolling Stones, Aerosmith, John Legend, Mary J. Blige and, speaking of who’s who, The Who. One of the appeals to rockers is the hotel’s on-premises recording studio. But movie stars like the place, too: Brad and Angelina, Kevin Costner and George Clooney have all been registered here under pseudo names, many staying, as I did, in one of 40 recently added Mediterranean-style villas. The hotel restaurant, The Restaurant, has an unpretentious name that belies its excellent cuisine, as my friend Nancy and I discovered at a Sunday champagne brunch, where the carving station offered such standouts as Alaskan Salmon Wellington, Black Angus prime rib, sautéed French green beans and creamy fingerling potatoes. There were salad, pasta, cheese and dessert stations and omelets and crepes made to order. “Please refrain from using cameras or cell phones while in the restaurant,” reads a note on the menu; part of the hotel’s policy against photography in public areas, further protecting privacy of its guests. At the hotel’s full-service spa (simply called The Spa, of course), I enjoyed a facial on a Porsche massage bed featuring the French line of Guinot products. My clinician shared that the most popular treatments are massages, which most patrons enjoy, not surprisingly, in their villas. But I appreciated The Spa’s serene ambiance, from the soothing aromas I encountered upon entry to the candlelit hall that led to my treatment room. There my “congested” face was soothingly treated with a series of applications and a rosy complexion stayed with me for days after. The hotel’s Bar 1200 opens at 8 p.m. and is the celeb-spotting bar of LA. That’s where our LA friend Laura turned in her seat and found herself nose-to-nose with a smiling Bruce Springsteen on a recent visit. Our two-bedroom, two-bath villa featured king-size pillow-top beds (talk about heavenly sleep in December); My bathroom featured a shower with cascading rainforest spout and a marble soaking tub, complete with two yellow duckies and Aveda bath products. In the spacious living room, I could picture recording artists lounging on the L-shaped leather sofa, perusing Guitar Aficionado magazine, and composing tunes on the Yamaha piano, which our bellhop pointed out, was always kept in perfect tune. From our back patio, a brick walk led down to the hotel’s two pools, The Spa and The Restaurant. At night, twinkling lights reflect in the waterfall that flows from The Restaurant’s edges. At the outside six-stool restaurant bar we met Matt, down from Seattle for the live finale of Survivor at CBS Studios. Matt planned to meet with some of the show’s producers, because his company was interested in creating a 24-hour reality feed of the show, like the one they created for Big Brother. “Hollywood and Highland” is where you’ll find the Kodak Theatre, home to the Academy Awards since 2001, and Grauman’s Chinese Theatre, where you can step into the footprints of Hollywood royalty. An underground garage serves the venues, with a very reasonable $2 parking fee, with validation. 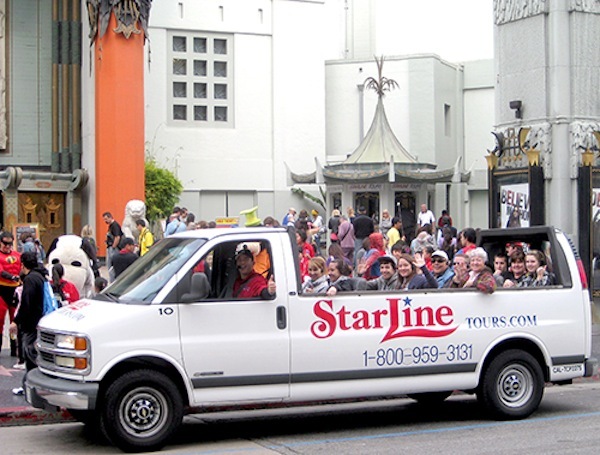 In 1998, Hollywood’s Community Redevelopment Agency provided $90 million to spur development of the property next to and including the Chinese Theatre. The CDA also constructed a Red Line MetroLink station at the site. Today, the 387,000-square-foot development incorporates shopping, restaurants and nightclubs and Grauman’s original showcase theater, where movies still air and tours ($13) are given daily. There’s a six-plex theater in the back, but the original, ornate, 1,400+ seat theater, declared a Los Angeles cultural-historic landmark in 1968, is intact. Be sure to take a tour of the Kodak Theatre (30 minutes; $15), which opened in November 2001. You’ll learn much about the Oscars including these tidbits: The Kodak Theatre’s contract to host the Oscars runs until 2071. The pathway through the shopping center leading to the Kodak Theatre is also red carpeted; storefronts are hidden from view with massive red drapes. David Rockwell was the architect who designed the 3,332-seat, five-level theater in the style of an Italian opera house. Side box seats are bestowed to academy board members. Beginning in late December, massive billboards touting movies deck out Sunset Boulevard with the words “For your consideration;” a not-so-subtle beg for Oscar nominations. You can be one of the 250 seat fillers who fill seats of celebrities as they run up to receive Oscars and then proceed backstage (and down a long corridor) to the pressroom at the Renaissance Hotel. Apply at seatfillers.com. Ever wonder why some actors seem a bit tipsy delivering their acceptance speeches? Free drinks are dispensed from the theater’s lobby bar starting at 2:30 p.m., when celebrities begin arriving, until 10 minutes before the 5:30 p.m. airtime. That’s when the bar begins charging, a surefire enticement for celebs to take their seats. After the ceremony, stars simply board elevators to the fifth floor for the Governor’s Ball where Sequoia Productions transforms everything — ceilings, walls, floor, light fixtures — into a fantasy environment par excellence. The staging of the ball alone is upward of $30 million, and that doesn’t include the catering, for which Wolfgang Puck has the exclusive contract; the Academy picks up the tab. 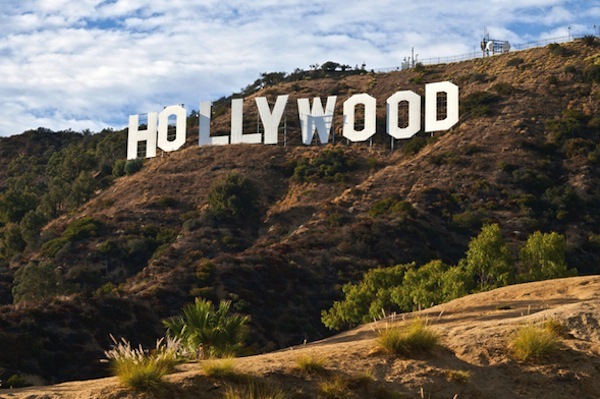 Get your exercise along the Hollywood Walk of Fame The Hollywood Chamber of Commerce initiated the idea as early as 1953 that terrazzo tiles with brass stars adorn the sidewalks of Hollywood Boulevard, but it took another seven years before the first stars were installed. “Mr. Hollywood,” Johnny Grant, a popular radio personality and television producer, is largely credited with bringing the walk to international prominence. He required that each star to be honored on the Walk of Fame must attend the installation of their star. Back in the ’60s, Grant instituted a fee of $2,500 to be paid by the person or entity that nominated the star. Today, there are 2,400 stars along 1.3 miles of Hollywood Boulevard and Vine Street. The current fee for the honor is $30,000. For the ultimate in Hollywood kitsch, splurge on a Starline Tour of the stars’ home. The ticket booth is right on the Grauman’s property; $44 per person for the two-hour tour; $39, online). Yes, you too can see Keanu Reeves’ trash cans, the roofline of Jennifer Aniston’s home, the Avanti parked in David Arquette’s driveway and stars adorning Ringo Starr’s wrought iron gate. For all its gawkiness, the tour was fun and informative, not just for peeks at stars’ homes from today and yesterday (Frank Sinatra, Elvis, Cher, Charlie Chaplain, Harry Houdini), but also for landmark chatter. As we passed the Hollywood Roosevelt Hotel, I learned this is where Douglas Fairbanks hosted the first Academy Awards in 1929. A couple of blocks away, we recognized the church where Whoopi Goldberg and her fellow nuns filmed Sister Act. We stopped at an overlook on Mulholland Drive (named after William Mulholland, the head of the Los Angeles Department of Water and Power who was responsible for bringing water to the LA basin via aqueducts). While others scurried up the hill to take photos of the Hollywood sign, on this foggy morning, I elected to hang with Devon, our tour guide, who told me he was also an actor and had a SAG card (initiation into the Screen Actors Guild is $1,800, plus you have to have enough credits to get one so I was impressed). Devon has been in more than 100 commercials, but the work isn’t steady, so unless he strikes it big with a long-term gig, he said, you’ll find him behind the wheel and on the minibus mic at Starline. We slid down Laurel Canyon, up Sunset and into Beverly Hills, passing the Whiskey A Go-Go, where the Doors were the house band in 1966 and the Troubadour on Santa Monica Boulevard, where Carole King and James Taylor played together in 1970. Now I know where Wolfgang Puck and Dr. Phil live, and I saw that Carol Burnett and Jim Nabors are indeed neighbors. Tour the busiest movie and TV studio in the world: Warner Bros. I picked the winner for my first studio tour: Warner Bros.’ VIP tour (2 hours; $49 per person) gave an intimate and educational tram-ride tour of sound studios and backlots sets, with lots of opportunities to get off and walk around. If you want action and thrills and have kids in tow, you should probably skip this tour and head to nearby Universal Studios. Warner Bros.’ 110-acre studio includes 29 sound stages and a 10-acre backlot, complete with a “Midwest Town” (with a River City, Iowa, set from The Music Man), “New York City” streets, a church, embassy, courthouse, subway station entrance, parks, and more, including “Rick’s Café” from Casablanca. All have been used in productions over the years, and are never recognizable from one film to the next.Exact time periods are introduced through set designs: even the doorknobs are changed on buildings. Inside the sound stage where Harry’s Law is filmed, we viewed an “interrogation room” and learned that each scene here was filmed twice, allowing lights to be centered on the actor on each side of the interrogation table. Warner Bros. is home to the largest sound stage in North America. Seems that film siren Marion Davies complained to boyfriend Willie that the sound stage for her film with Clark Gable wasn’t nearly large enough. So William Randolph Hearst paid for it to be enlarged to a height of 98 feet, making Sound Stage 16 one of the world’s largest. Can’t say it added much to the legacy of Davies’ film, Cain and Mabel. The tour includes stops at Warner’s automotive museum and studio museum, and a visit to the props department holding a million-plus props. Here, we learned that if you make a movie that is based in 1980, you don’t want to furnish homes and shops with all circa-1980s props. “That’s not how people live,” said our guide, Jacob. “People have things in their homes from the prior decade or two as well as the current time.” On the sitcom sets of The Big Bang Theory and Two and a Half Men we sat in studio-audience seats as Jacob explained the process of filming a sitcom: stars rehearse lines on Monday, practice their marks and positioning on Tuesday, shoot offsite scenes on Wednesday, rehearse Thursday and shoot before a live studio audience on Friday. Stars like sitcoms because they have such a predictable schedule, Jacob said. “What happens if someone in the studio audience sneezes or has a really raucous laugh?” I asked. Jacob pointed to small suspended microphones above each bank of seats. “Each can be turned off in post production,” he explained. “Do the actors ever forget their lines?” someone asked. Jacob rolled his eyes. “Happens all the time. And it’s always hilarious. The audience howls and then they just do another take.” At Two and a Half Men, we saw the schoolroom that Angus T. Jones, who portrays Jake Harper on the series, attended since the show debuted in 2003. “He grew up here at the studio,” Jacob said, and pointed to the notches in a growth chart marking Jones’ height with each year. He’s now 5’ 10,” a high school grad and pulls in $300,000 per episode. Nice. Once you’ve been on a studio tour, you appreciate that the entertainment industry is just that: an industry where technology, education, and a century of know-how are married with hard work by all manner of production people. No two Warner Bros. studio tours are alike; they ebb and flow with productions underway. Tours are often led by working studio professionals, each of whom brings along their own expertise and personal observations. Jacob also works as a production set designer and explained the nuances of set design along the way.